When it comes to Berwick-upon-Tweed, yes, I am prepared to be controversial here, though only a little bit. This fine historic place just happens to be one of my favourite towns anywhere. It's just the right size and it wears its history plain to see in the shape of its well-preserved Elizabethan fortifications and its fine bridges across the River Tweed. Right in the centre, the handsome time-worn town hall is dead ahead. If it’s a Saturday, Berwick-upon-Tweed will be holding its reassuringly slightly scruffy street-market and, judging by the wares on sale, your first thought will be, ‘Heck, how many high-visibility jackets does a chap need?’ But then, they just catch your eye. By definition, really. (Pictured) The Old Bridge, Berwick-upon-Tweed, early 17th century. It’s one-way, southbound and we do not interpret this as a metaphor. (Pictured) Roofscape in town. It’s the walls that are squint and squee-gee. Not the picture. Berwick has olde-worlde bits like that in quite a few places. Park (easy, we usually just roll down through the town and straight out through the walls again and out on to the quayside but there are lots of other places). Berwick cares about its shoppers, so you can park for free so long as you use one of these time-disk clock-face card-thingies, which you pick up locally. After you have sorted out that, then wander through the town and its shops and you can browse for books, musical instruments, heaps of wholefoods and other ethically sourced stuff (mostly on Bridge Street). Or you could haggle over a set of spanners at the street market to go with the hi-viz jacket. Then go for a walk, right round the old walls. Anyway, afterwards, there are plenty of cheery wee places that do decent coffee or lunch. 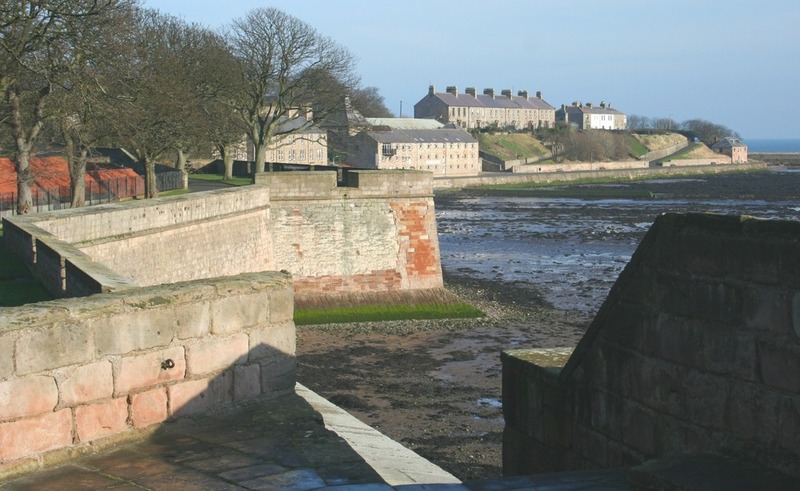 In addition, Berwick Barracks, in a handsome 18th-century building with its wide parade ground, is very well presented by English Heritage, the down-south equivalent of our Historic Environment Scotland. The town also has an active cultural centre, theatre, etc, called The Maltings and, as a creative kind of town, it is also associated with a variety of artists, past and present. The painter LS Lowry was especially fond of the town and there is a Lowry Trail to follow, though there are few matchstick men to be seen in the streets these days. The Granary, as an exhibition venue, between The Maltings and the river, is worth keeping an eye on. By the way - eating tip - The Maltings Kitchen is excellent for lunch. Delicious menu, friendly staff. We go there when we can - which isn't so often these days as we live at the other end of Scotland! We miss it though. Oh, and - drinking tip - check out The Curfew, a very tiny brewery, actually a 'micro-brewery', in Bridge Street nearby. Dog friendly as well. Where to stay? The Walls Bed and Breakfast - set on the city walls with great views of the River Tweed and a great location to walk to pubs and restaurants. Alannah House B&B is also centrally located near the city walls. Berwick-upon-Tweed also has plenty of beach for dog walking (if you must), though you could also stroll along the promenade at Spittal on the south side of the River Tweed, or head out on the slightly disconcerting breakwater that forms the north side of the estuary of the River Tweed. (Pictured.) The breakwater is only disconcerting because it seems to go halfway across the North Sea towards Denmark. Berwick-upon-Tweed from half-way across the North Sea. (Pictured) The Royal Tweed Bridge of 1925 (actually the old A1) plus the impressive 28-arched Royal Border Bridge (1847) all add to the ambience, and give a sense of permanence and history. The skyline, with its spires and red tiles, is also eye-catching. There’s only one little hitch here for mentioning it on a site about Scotland . Berwick-upon-Tweed isn’t actually in Scotland. (Pictured) The fortifications at Berwick-upon-Tweed. Tide’s gone out I see. When built in Elizabethan times, c.1588, they were the largest single investment in England. Still, well worth it to keep out the Scots, I expect. They remain the only example of bastioned town walls anywhere in England (or Scotland). Sure, Berwick has been Scottish in the past. In these warring border-lands, it changed hands several times, finally becoming part of England in 1482. Central to its story is its strategic location on the border. Today, the old county of Berwickshire is in Scotland. The town’s football and rugby teams play in Scotland. But you seldom see it in Scottish guides, at least, not much after Murray’s Handbook for Scotland, 1894 edition. In tourism terms, the Tartan Curtain descended and promotional activity was defined by administrative borders rather than what made a logical day’s touring for the visitor. Berwick is a great day out! Irrespective of which side of the Border you are based, Berwick-upon-Tweed is a great day out - and a must-see if you’re travelling north for a Scottish tour. In fact, follow this link for a Scottish tour from Berwick-upon-Tweed. To be accurate, this is the route description from Edinburgh northwards – but Berwick-upon-Tweed is an easy drive by the A1 to Edinburgh, allowing, say, 90 minutes. And if you are spending time in this part of the Scottish Borders, then make sure you take in picturesque St Abbs as well. Plus there are fine coastal walks along the Berwickshire Coastal Path hereabouts as well. Finally, you can also see Berwick-upon-Tweed by way of a Borders tour in a 16-seater coach starting from Edinburgh. Recommended. (Above) Berwick-upon-Tweed from the south side of the Tweed. Old Bridge on left, Town Hall spire to the right.